The Write on Challenge is finished now and I'm still writing my letter a day. This is a beneficial thing on two levels; one being that my letters get replied to promptly and secondly, it does not overtax my hands. I have a problem with carpal tunnel syndrome that is aggravated by arthritis and when I do too much I have a great deal of difficultly, so writing and working in moderation suits me just fine. The last day of the Letter Writing Month Challenge culminated in a perfect ending for me. I received two letters. The first was from Mrs. Duffy whose beautiful handwriting and signature ink colours make her letters stand out. 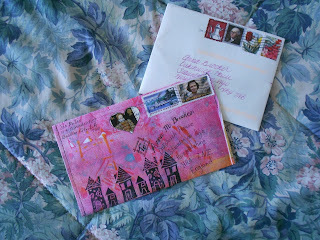 She has such a distinctive style and it's a pleasure to receive a letter from her. The second letter was from a new friend who undertook the Write on Challenge too. Jen sent her letter in an incredible envelope which she crafted herself. She also included a wonderful poem by Anne Sexton. April was also Poetry Month so Jen cleverly incorporated the two by sending poems with all her letters and I was delighted to be the recipient of one of her carefully chosen poems. This month ended on a high note for me. I've conquered my pile of mail to be replied to with only one or two remaining and have bonded with others who took the challenge. It's been a worthwhile experience to me as I now have that anticipation for writing my daily letter which serves to make it a better conversation and I enjoy the process so much more now. Ha! It was quite an experience trying to keep up with that challenge, and even if I didn't do 30/30, I was satisfied. I really think their should be challenges that are less challenging! A letter a week, 52 a year. Then if you do more you can be so proud of yourself. Let's face it, most people don't send letters at all so making it easy, even one letter a month, would be a big increase in mail, and more people might be interested in trying. I'm glad you liked my poem--the one you sent me was wonderful! It was an experience, but a productive one as well as an enjoyable one. I think a letter a week might be a good challenge, maybe we should dub 2017 Letter Writing Year and have our own challenge.